In recent years townspeople have reported sighting fishers, the 10- to 15-pound weasel-like martens that have been making a recovery in the region. Their appearance is no accident. In 1988, the Connecticut Department of Environmental Protection bought a bunch of live-trapped fishers from upper New England, and released them in western Connecticut. The aim was to restore an animal that had once been native to the state, but had been driven away by the agricultural deforestation and perhaps overtrapping. Today, fishers are found throughout the state and are doing so well, licensed trapping is allowed in the fall. While fishers don’t fish – or even eat fish, they do love a tasty porcupine. That thorny fare is in rather short supply, however, so they have turned to a more abundant mammal for food: The squirrel. In fact, in northern Vermont and New Hampshire, where the fisher was never extirpated, squirrels are much less common than they are here. The natives say it’s because the fishers keep them under control – good news for anyone who’s ever had squirrels invade their home. Bringing back Fischer cas in CT was a hasty decision. Most of CT is residential with few large forests like Vermont and New Hampshire. Fischer cats do not only eat squirrels but prefer to dine on house cats and small dogs. I think to bring a wild animal into residential ares is short sited. I can predict that a small child will be mauled by these animals and then these fischer cats which bellong in the wild will be known as a menace to residential areas. This unfair to the fishcer cats and residents as well. 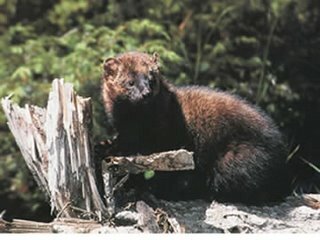 Last week i saw a fisher in south central CT. What a sight! I must have woken it up while i climbed a rock outcrop uphill of the hemlock it was sleeping in. It was at my eyelevel but forty feet in the tree. We looked at eachother for a moment until my slight movement to grab my camera sent the fisher dashing down the hemlock headfirst to the ground below in little more than a second! In response to the previous commentor, the fact that the fisher has made it all the way to North Guilford in nine years is testament that CT is plenty forested, as the fisher seldom travels outside the forest let alone its prefered coniferous forest with large trees and dense canopy! In fact the DEP state on their webpage that CT is more than 60% forested, so actually MOST of CT is Forest, not residential. House cats should wisen up to the realm beyond the backyard or stay inside! Countless times i have observed a house cat kill a mouse/bird/chipmunk and not even eat it... The cat usually tortures the animal either while still alive or play with it after its already dead and then bring it to show off to the master... Well the fisher is an efficient killer with genuine purpose and is known to cache uneaten food to which it returns when again hungry. Thank you DEP for trading those turkeys for fishers nine years ago! Just remember not to leave babies unattended in your local coniferous forest after dusk and keep fluffy and fufu inside!